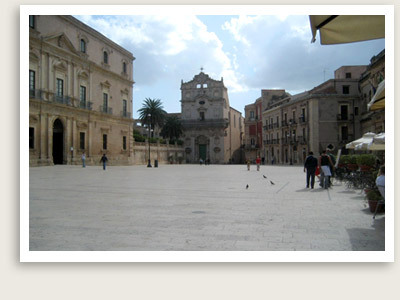 Private Tour of Siracusa & Ortigia Includes: Roundtrip transportation, private licensed tour guide, taxes, tolls, parking. Not Included: Entrance tickets and licensed expert guide for and archeological sites. Departure Points: Catania, Taormina, Agrigento areas. An expert guide conducts this custom private tour of Siracusa, an ancient city, and Ortigia island, one of the many highlights on your tour of Sicily. 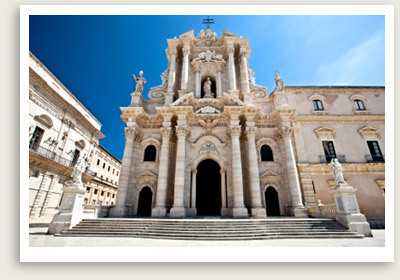 Founded in 734 BC by the Greeks, Siracusa was one of the great ancient capitals of Western civilization. This ancient city quickly grew to rival and even surpass Athens in splendor and power. Siracusa still has some of the finest examples of Baroque art and architecture, along with fantastic Greek and Roman ruins. Your private tour guide will take you on a tour of this city and its archeological sites, including a Roman amphitheater, beautiful Greek temple, a famous grotto called the Ear of Dionysus, and the most complete Greek theater surviving from antiquity. You will have time on your own after the guided tour to enjoy Ortigia Island, a relaxed, comfortable and beautiful place to spend a leisurely afternoon. The lively baroque old town offers interesting shopping, charming piazzas and lots of outdoor cafes and bars.